Qs. How do I get Uber Checkin to work with iOS 7? Qs. 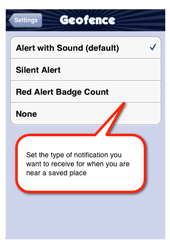 How can I customize my foursquare shout message? Qs. How can I see all of my Uber Auto Checkins? Qs. 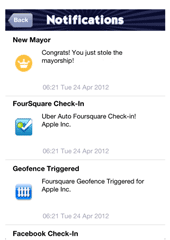 Will the Uber Checkin app help me become a Foursquare Mayor? Absolutely! 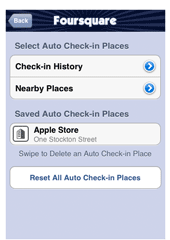 When an auto checkin happens the app will also automatically check to see if you are close to becoming Mayor of a saved location or if you have become the Mayor and will notify you to let you know! 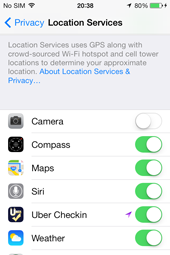 Location monitoring on the iPhone can occasionally be inaccurate or may even have stopped updating as you move. 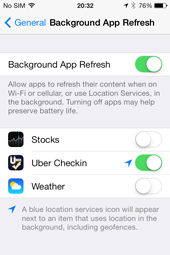 To force your iPhone to refresh your location and start updating again go to the Settings screen of your iPhone disable Airplane Mode for approx 20 seconds and then re-enable it again, forcing your device to update your location. Qs. 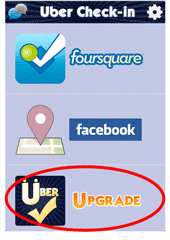 I’m using an iPhone 3GS – will Uber Checkin work? 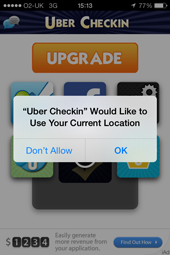 Unfortunately the Uber Checkin app requires location monitoring functionality which is only available on the iPhone 4 and iPhone 4S. Qs. How can I save more than 3 places for auto checkins? Click the Upgrade option on the home screen of the app to purchase an In App Upgrade that will remove the limit on the number of places you can save. 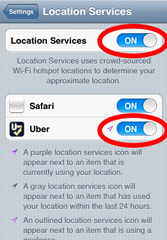 Please note that the iPhone can only support up to approximately 16 – 20 places (to protect your battery life) . Qs. 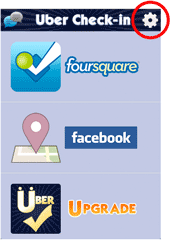 I’m using Foursquare; can I post my Uber Checkins to my Twitter and / or Facebook accounts? 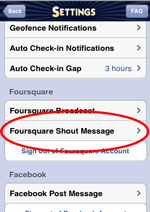 Yes, simply go to the Foursquare Broadcast Settings screen and enable Twitter and / or Facebook. 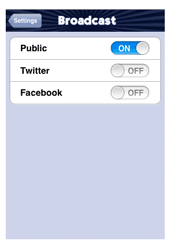 Check that you have set the Broadcast option ‘Public’ to ON. 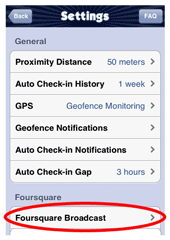 If it is OFF then all auto checkins are marked as private and will be hidden from other Foursquare users. 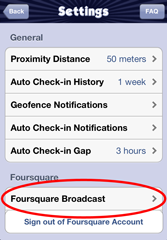 You can find this option on the Foursquare Broadcast Settings screen under Settings. Qs. How do I delete a place from my list of Uber Checkin places? Go to the Foursquare screen and swipe from left to right on the place you want to remove from your list. Click the red delete button that appears. Qs. Why did I get notified of a Geofence trigger but the Foursquare or Facebook checkin failed? Tracking your location does not require an internet connection; just a mobile network connection. 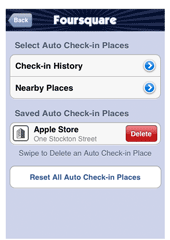 However Foursquare and Facebook auto checkins require an internet connection – so if a checkin fails it is because the iPhone does not have access to the internet. Try reseting your internet connection by toggling the Airplane mode in iPhone Settings to ON and then back to OFF. Qs. I’m getting too many notifications – can I stop them? Qs. 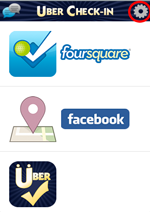 Can I change the Foursquare or Facebook account that I registered with? 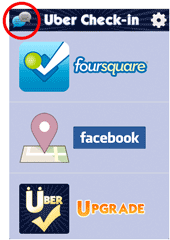 Go to Settings and scroll down the screen to the Foursquare section. Click the link ‘Sign out of Foursquare account’. This will reset all saved Foursquare data in the Uber Checkin app and cannot be undone. The next time you click the Foursquare icon on the home screen you will be prompted to enter your new foursquare credentials and select your Uber Checkin locations. Follow the same steps to change your registered Facebook account. Qs. I’m have a question that is not answered here – how can I contact you? Send us an email at ios@ubercheckin.com and we will get back to you as soon as possible! We aim to respond within 24 hours.